BeginAgain was founded on the principles, ideas, and inventions of Benjamin Barlowe, an early 20th century inventor from Fort Collins. Ben's fantastic tales and astute observations of his grandchildren, Zadie and Fuller, are the inspiration behind our products. His archive overflows with tinkered toys, playful mechanisms, and incredible stories filled with nostalgia, history, and lessons on how things used to be.Created by toymakers David Bowen and Chris Clemmer, two of the co-founders of Sprig Toys, BeginAgain is focused on thoughtful product design and imaginative storytelling for today's kids. It is our goal to inspire children with stories of invention, adventure, and good old-fashioned fun. 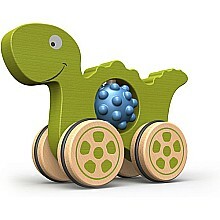 BeginAgain toys teach through play and nurture the development of the whole child.